Flu season hits North America every year around October and lasts until March, although sometimes it lingers until well into May. For most people, a bout with the flu is uncomfortable and annoying but it’s soon over, leaving no lasting effects. For others, influenza can be very dangerous, even deadly. The people in these high risk groups are urged each year to get a flu vaccination but it’s a good idea for everybody else, too. This year’s vaccination, however, has stirred up many questions about how effective it truly is. The people most at risk for severe consequences of the flu include pregnant women, young children, the elderly, and anyone with an immune system compromised by other medical conditions. Some of these medical conditions include cancer therapy, HIV/AIDS, and many common chronic illnesses such as heart disease and diabetes. The flu virus is a lot like the human population: we are all people but we’re all different. Influenza specialists and public policy advisors constantly monitor flu activity around the world to know which strain of flu virus is likely to be the most active in a given region during its flu season. Each flu virus strain is like a human family name: H1N1 and H3N2 seem to cause the most human illness. Within each strain there are variations; there’s a New Caledonia H1N1 and a California, Brisbane, and Solomon Islands H1N1. It’s medically impossible to create a universal vaccine that protects against all the different variations of the flu virus but it is a relatively sure thing to predict which three or four will cause the most illness each year. The flu vaccines we’re getting this year began the development process last winter, when the three or four most likely culprits were identified for causing illness during flu season in Asia. Pharmaceutical companies have worked all year to manufacture enough vaccine to keep the American population as healthy as possible today. This year, one of the four flu strains expected to cause illness in North America mutated between the beginning of the flu vaccination selection and manufacturing process last winter and now, when the vaccine is being administered. Three of the viral strains did not mutate so the flu vaccine is highly effective against them. There is one strain that is causing problems, but many of us will never come in contact with it anyway. Many healthy vaccinated people who do come in contact with this unique strain won’t get sick and others may experience only mild symptoms. It's also important to remember that vaccination doesn’t bring instant immunity. It takes a couple of weeks for the body’s immune system to become fully armed after any vaccine. 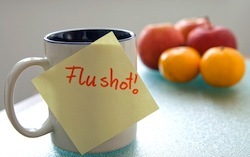 Exposure to the flu virus during this time of immune-system strengthening could bring on illness. Flu symptoms don’t begin at the moment of exposure, either. It’s possible to become exposed to the virus today but show no symptoms when getting a flu vaccine next week. In the following days, however, symptoms from last week’s exposure may develop, even though you’re now vaccinated. The symptoms don’t come from the vaccine, they come from exposure before vaccination. Even amidst the questions and controversy, it is highly advised that every woman who is pregnant or planning to become so during the next six months be vaccinated immediately against the flu. Influenza can jeopardize a pregnancy so any protection against the flu is better than no protection at all. Dartmouth College. Dartmouth/Univ. of Exeter Study: Correcting myths about the flu vaccine. 8 Dec. 2014. EurekAlert! Web. 8 Dec. 2014. Gorski, David. “No, the CDC did not just ”admit” that this year’s flu vaccine doesn’t work.” Science-Based Medicine. Science-Based Medicine. 7 Dec. 2014. Web. 10 Dec. 2014.